Vermont composer Lydia Busler-Blais (ASCAP) began her compositional education in high school and continued through New England Conservatory, Thayer Conservatory at Atlantic Union College, and the University of New Hampshire. Lydia has been commissioned by organizations including the Massachusetts Cultural Council, the Green Mountain Youth Symphony, and the Vermont Contemporary Music Ensemble. Commissioned by the ZINKALI Trio, Lanterns (2011) won an International Horn Society Meir Rimon Commissioning Fund Grant and has enjoyed performances from coast to coast. Lydia collaborates with playwright Lars Nielsen and together they have been awarded funding by the Consortium of Vermont Composers for their theatrical production One Way In to celebration the Year of the Vermont Composer. Some other recent performances of note have included Journale for Russian flutist Alexander Haskin, performed at the Nixon Library in Los Angeles and throughout California in 2011 and Cerberus at the Gloaming, commissioned by the Green Mountain Youth Symphony, performed by the group in 2011 for their 10th Anniversary Celebration. Lydia's vocal/instrumental folk work Thirteen Feathers and Thirteen Stones was performed at the Vermont Statehouse for the International Council of Thirteen Indigenous Grandmothers. 2012 has been a busy year of performances of favorite works like Moon Lilies for horn and piano and the Frost Cycle for soprano, horn and piano by artists across the US and at the Women Composers Festival of Hartford. Newer works like Lanterns and the horn duo Mysterium have also been performed at the 2012 Women's Work series in New York City and at the 2012 Northeast Horn Workshop. 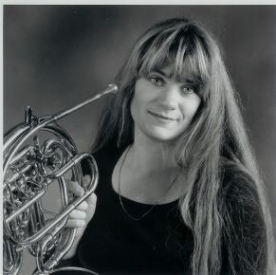 Lydia founded the New Leaf project, bringing works by Vermont composers for horn, viola, cello and piano, including her Boreal Quartet (2007), to diverse audiences across Vermont. Other recent premieres include Of Longing In Amethyst Hills (2010), composed for ARIOSO and scored for piano quartet with two female voices using original text, Eliza's Tune (2009) for trumpet and horn, Sleepless City (2009) for cello ensemble, Brass Quintet No.1 -- Earth, Light, and Time (2008), For My Love On His Birthday (2008) for voice, horn, cello, and vibes, and Nova Cantorum Ventus (2008) for flute, oboe, trumpet, clarinet, and horn. Busler-Blais' Uptown Train (2005) for voices, flute, oboe, and horn was composed on the spot and heard just hours later for the final airing of Kalvos and Damian's New Music Bazaar. Lydia is published by The Westleaf Edition and at her website. When Lydia isn't composing, she is a noted hornist, having played with the Manhattan Chamber Orchestra, Brooklyn Philharmonic, Jose Limon Dance Company, New York City Ballet, and the Boston Symphony Orchestra.